A couple of weeks ago I was in Wolfville for a Food/Film Festival. We wandered the main drag and I came across a yarn shop. My supply of variegated sock yarn was down to leftovers so I picked up four 100g balls of yarn. I knew they were subdued by looking at the balls but when the stash is as low as mine was I thought I should pick up one of each colour. Actually a mistake because the socks that knit up are so boring. 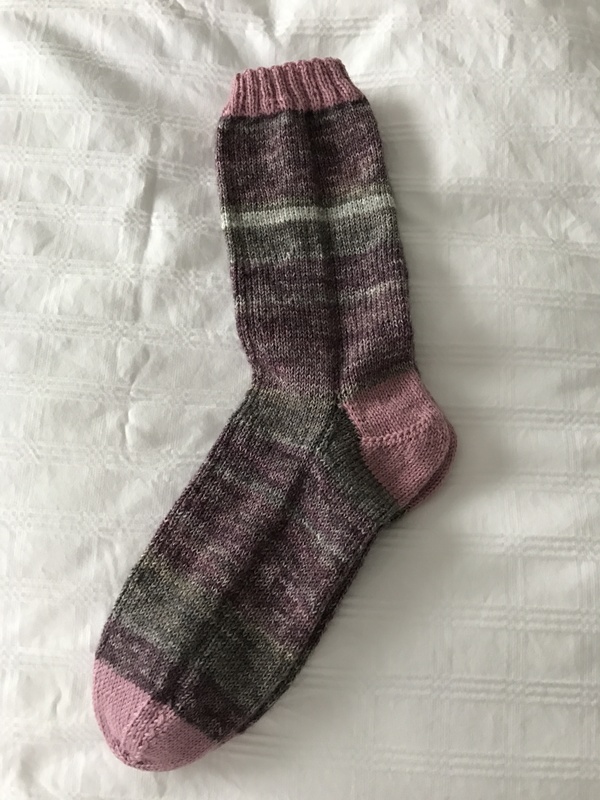 I tried livening up this pair with the light grey stripe and rose cuffs/heels/toes but no matter – what I got was a boring sock! I have three more balls left to work on. I gotta come up with some way of making the socks more interesting otherwise I’ll be bored to death working on them! And this was a women’s large size, for a friend who wears a size 10 shoe, so it took even longer to knit than my universal size for a 7/12-8 shoe size.